Totally Unnecessary, Totally Cool Fake News Report Debates "Avengers Impact"
It's very nice of Marvel to release this totally unnecessary but entertaining piece of viral marketing for Captain America: Civil War. They didn't have to create a fake news segment debating the independence with which the Avengers operate at the cost of collateral damage left in their wake but it does help as a primer for the film's theme. 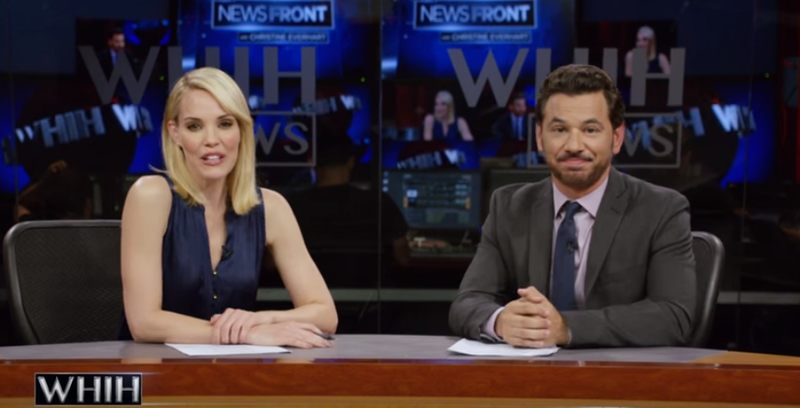 Anchored by Christine Everhart (Leslie Bibb), who we last saw in the first Iron Man, discusses with political correspondent Will Adams (comedian and Daily Show contributor Al Madrigal), whether or not the Avengers should submit to government oversight. It's a friendly debate, nothing like what would really happen on cable news in real life, but it lays out the premise of Civil War's basic rift between Captain America and Iron Man. I appreciate Marvel's continued promotion of the movie despite the fact that if they didn't provide one more trailer or poster or behind-the-scenes featurette it's still making a billion dollars. Audiences have made up their minds long ago that they're seeing Civil War. Who is there left to convince? Anyway, it was nice seeing Bibb again and Madrigal's addition makes him the third Latino actor, Michael Pena's Luis in Ant-Man and Maximiliano Hernández as Agent Sitwell are the other two, to enter the Marvel Cinematic Universe. Although, since it was a viral video doe it count as a film appearance? It's not a leading role obviously but someday Mr. Feige will deem Latinos worthy. Someday. You can also connect with the fake news site on twitter at @WHIHOfficial for more realistic looking news posts about events from Marvel movies. Captain America: Civil War conquers the world on May 6, 2016.